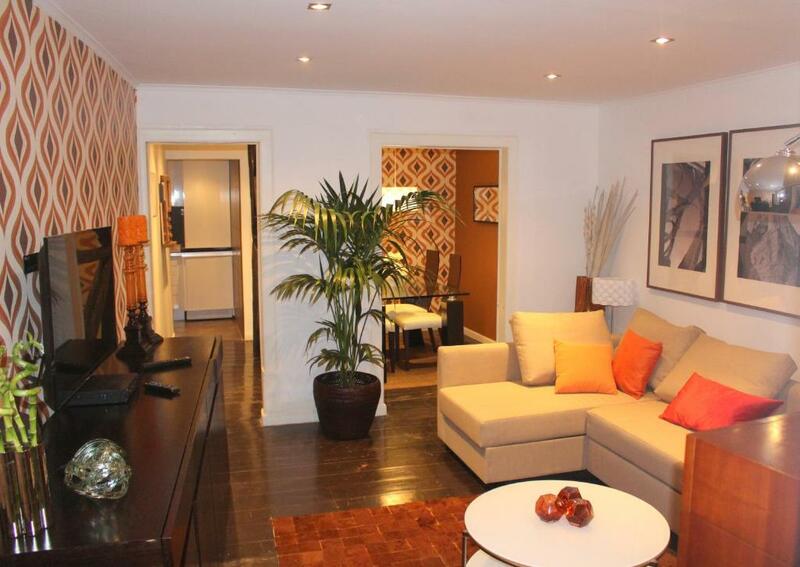 The Design Stylish Lisbon is a well-decorated one-bedroom apartment located 200 feet from Largo do Carmo, in Lisbon. It offers free WiFi access. The living room includes a retro-style wallpaper in orange and brown shades. 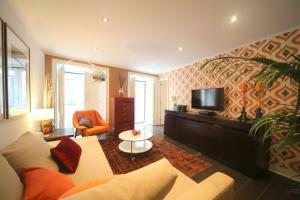 It is complemented by a vintage-style armchair, a sofa with chaise longue, a flat-screen TV and an ipod docking station. 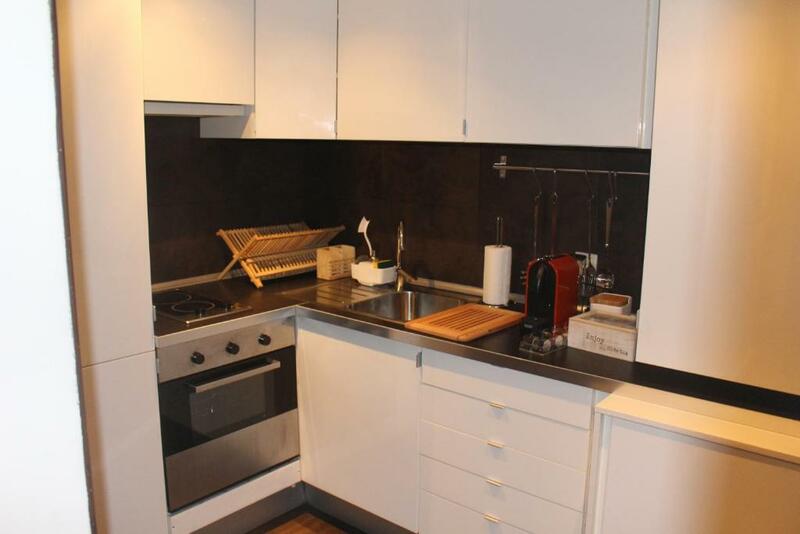 The kitchen is compact, but includes all the utensils to prepare meals, including a coffee machine. There is a separate dining area, decorated with the retro-style wallpaper. Guests are a few steps from well-known attractions, such as Carmo Church, located down the street, and Santa Justa Elevator, located 1,300 feet away. The beautiful Rossio Train Station is 1,650 feet from the Design Stylish Lisbon, and the lively Bairro Alto is within a 5-minute walk. When would you like to stay at Design Stylish Lisbon? 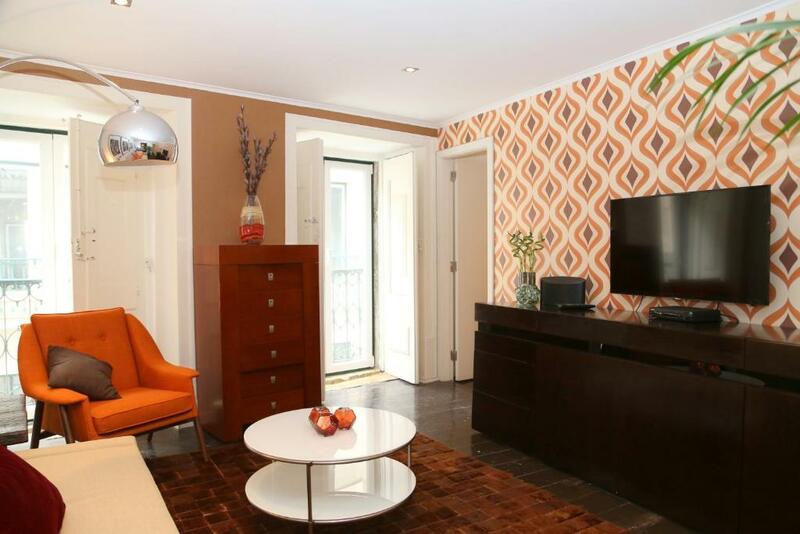 This unit includes a living room with a retro-style wallpaper in orange and brown shades. 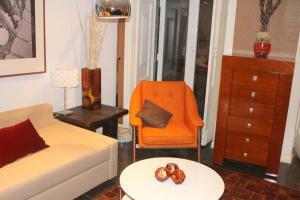 It is complemented by a vintage-style armchair, a sofa with chaise longue, a flat-screen TV and an ipod docking station. The kitchen is compact, but includes all the utensils to prepare meals, including a coffee machine. There is a separate dining area, decorated as well with the retro-style wallpaper. This is a great apartment on the first floor. 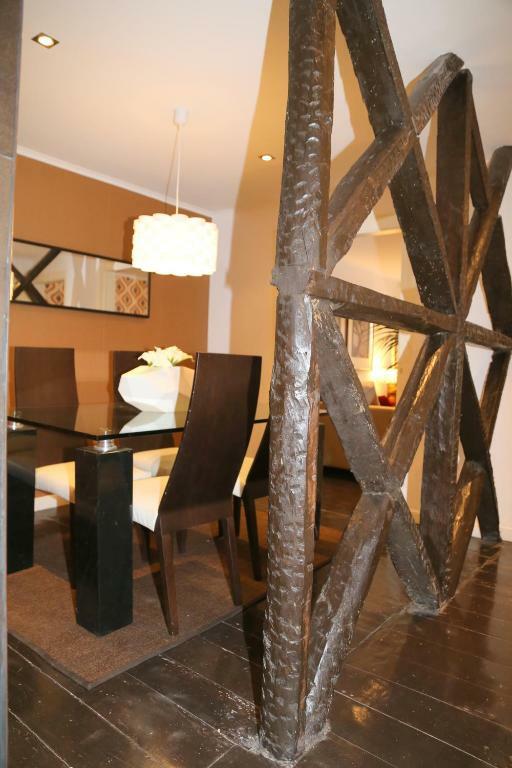 Is spacious and very tastefully decorated with plenty of light. The bedroom has a double bed, a wardrobe and also a working desk. 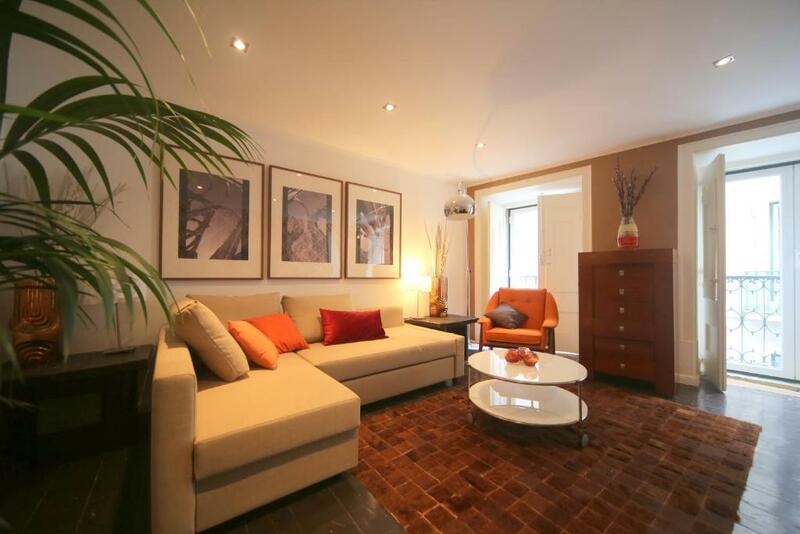 In the living room you can relax, watch TV or plug your Ipod into the dock provided. The dinning area has a large table than seats 4 very comfortably. The kitchen is fully equipped and it has an Nespressso machine, washing machine, cooker/over, microwave, Kettle etc. 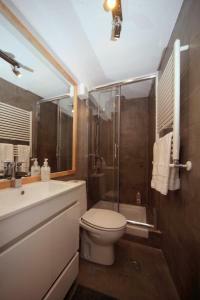 The bathroom has a nice shower and plenty of space. Chiado is probably the most elegant and trendiest neighborhood in Lisbon. Is also the location of some of Lisbon theatres and has always been the place to meet before heading out into Bairro Alto. There is plenty to choose with some of the best restaurants just a short walk away and also the famous Brasileira Coffee shop. House Rules Design Stylish Lisbon takes special requests – add in the next step! 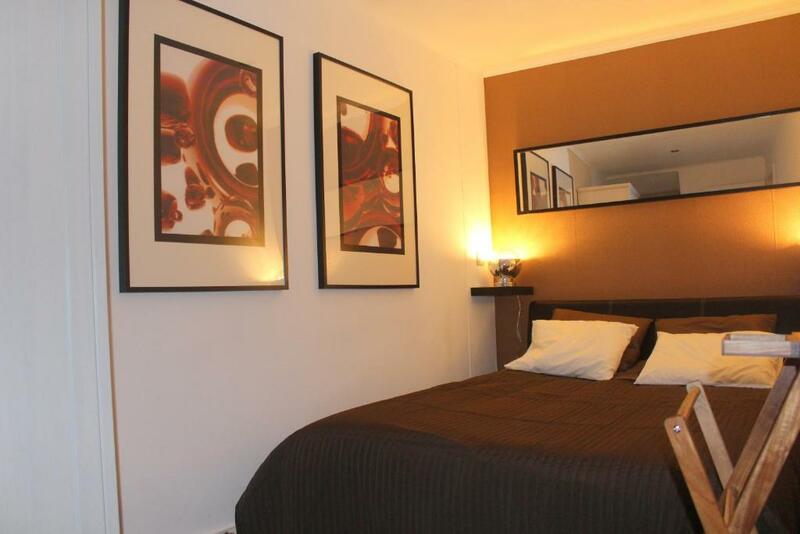 A EUR70 damage deposit is required on arrival (around USD78.01). This deposit will be fully refunded at check-out, as long as there isn't any damage to the property. Design Stylish Lisbon accepts these cards and reserves the right to temporarily hold an amount prior to arrival. Please note that the 50% deposit is charged on day of booking. The remaining amount will be charged in cash at check-in. A damage deposit of EUR 70 is required on arrival. That's about 78.01USD. This will be collected by credit card. You should be reimbursed on check-out. Your deposit will be refunded in full by credit card, subject to an inspection of the property. We need at least 5 reviews before we can calculate a review score. If you book and review your stay, you can help Design Stylish Lisbon meet this goal. Was an excellent location as we could walk nearly everywhere. Great having a washing machine. Everything we needed was provided.